(VIII - 5 speed only) Built for the (03-06) Mitsubishi EVO... Agency Power has always focused on real racing performance. With its strong alliances with some of the fastest EVO VIII's on the tracks, Agency Power has finished testing and is proud to release its brand new short shifter for the 2003 and up Mitsubishi EVO. This 5 speed short shifter is designed to give you a fast, clean, and precise shift that the stock shifter lacks, and the competition tries for. The shifter reduces the throw about 35% compared to the factory shift lever. In addition, the shifter height is lowered about 15mm for a sport feeling to help you get through the gears more efficiently. The CNC machined short shifter is made from 1018 High Strength Steel. The lever is then zinc coated in black for a stylish stealth look. 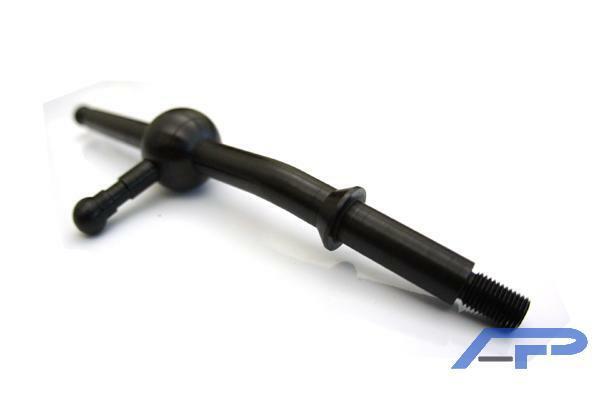 This short shifter is a perfect addition to your high performance or off the lot Mitsubishi EVO. Whether you are road racing, drag racing, or daily driver this shifter will improve your driving success.